When it comes to offset printing, it is inevitable that your print has a record variation of 2 or 3 tenths of a millimetre. For elements considered medium and large, this variation will not make a difference in the final print result. However, for smaller elements as well as fine lines and texts with size smaller than 8 points, this variation may be more evident. 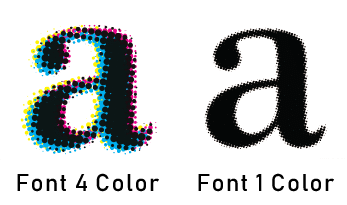 To avoid any problems with printing, we recommend that you do not use more than two colors in the composition of these small elements, as it may lead to loss of legibility in the case of fonts. Note that the four-color font may have a “blur” effect, making text readability much harder. Since the font with only one color, even being small, does not make it so difficult to read. For fine lines (lines less than 2 dots thick), the logic is the same. Let’s say as an example that you set the color of your line to brown. Three colors are required to compose brown: cyan, magenta, and yellow. Your desired setting is a brown line. But note that in print the registry variation, although small, can make the line that should have only one color, in a line with five colors. For this error to occur, it is important that these small elements do not consist of more than two colors in their composition. Or, if possible, the elements should be enlarged to a size where color composition does not cause problems. In our example of the brown line, it would be ideal if the line were at least 3-4 dots thick, or in case of a thin line that was not made in brown, but in a single color (for example, in black ). What is a doll? How to make a doll?